If you've played through Left 4 Dead 2's second campaign, Dark Carnival, you're likely familiar with the music and pyrotechnic power of the chapter's fictional rock and roll band, the Midnight Riders. Well, they've got their own web site. 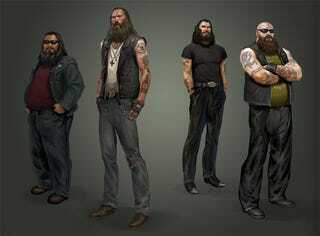 Shortly after the launch of Left 4 Dead 2, Valve launched the teaser site—seen on posters around Dark Carnival—for the tattooed biker band, offering little more than a portrait of the four-man group and a promise that something is "coming soon." What could that something be? It could be nothing more than some fiction building, offering background on the Midnight Riders and how they came to escape the events that transpired at the Whispering Oaks zombie infection. Graffiti scrawled on the walls of Whispering Oaks' safehouses hint at the quartet escaping, buying their way into evacuation prior to playing their explosive set, but we never see them. What we hope, however, is that we'll get to actually play the events that lead up to the Midnight Riders' escape, possibly in the form of downloadable content. With the chapter-to-chapter events more tightly linked than in the original Left 4 Dead, perhaps Valve is going to give a new group of Survivors a chance to tackle the zombie horde. Left 4 Dead 2's Versus mode—brilliant though it may be—could benefit from a shorter, Crash Course-length campaign. And we hope that they come armed with new Midnight Riders appropriate melee weapons — bottles, bike chains, pool cues and flying V guitars. The four members have the unique silhouettes that would make them easy to pick out in an infected mob, so they may fit in nicely as new playables. Of course, if they're just a group of special zombies, that'd be fine too. But we'll keep an eye on new developments, just in case anything pops up.